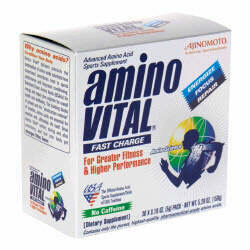 Ajinomoto Amino Vital - Fast Charge - Natural Energizer! On sale now! Details:Dietary Supplement. For greater fitness & higher performance. No caffeine. Energize. » Repair. Contains only the purest, highest-quality, pharmaceutical-grade amino acids. Ajinomoto - The world's No. 1 amino science company. » Energizes, while combating fatigue. » Increases fat burning with exercise. » Helps maintain focus during workouts. » Encourages muscle recovery & repair. Why Amino Acids? Condition your body. Ingredients: Other Ingredients: Citric Acid, Artificial Flavor, Aspartame. DirectionsHow to Use Amino Vital: Consume directly from the pack and wash down with water - or, if you prefer, mix with juice or water and enjoy! For longer-lasting or more strenuous workouts, consider consuming as many as three packets, before, during and after exercise. Keep packs in a cool place.